What is an Idaho Promissory Note? Idaho Promissory Note: What Is It? An Idaho promissory note is a written promise to repay between the lender and the borrower. The agreement outlines the amount of the loan and how it will be repaid. Idaho promissory notes may be secured or unsecured. With a secured promissory note, the lender gains the right to collect property, known as collateral, that the borrower promised when they agreed to the conditions of the loan. When a promissory note is unsecure, the lender does not have the right to collect collateral if the borrower defaults. Idaho law governs the use of promissory notes regardless of whether they are secured. For personal loans, the maximum amount of interest that may be charged is 12%. However, for interest related to receiving a monetary judgment (also known as the judgment rate), that interest rate is changed by the Idaho State Treasurer’s Office each year. If a lender charges more than the maximum interest rate, they may be subject to legal charges by the State of Idaho. How to Write an Idaho Promissory Note? An Idaho promissory note needs to include vital information about the parties involved as well as the loan. It also needs to include information about collateral, if the note is secured, and specific clauses. Secured promissory notes should be titled as such. The date the Idaho promissory note was created. This date is placed beneath the title. It is formatted as month, day, and year. The borrower’s legal name and mailing address. Put the word “borrower” next to their name. For secured promissory notes, include the physical address if it is different from the mailing address. The lender’s legal name and mailing address. The lender may be an individual or an entity. The lender should be titled as such. If the payment address is different from the mailing address, that information should also be included. The principal amount. The amount of the loan, without interest, is known as the principal amount or principal balance. Ensure that the amount is accurate before it is properly executed. This is important since this document is legally binding once it’s signed and dated. The amount of interest charged for the loan. This may be expressed as the per annum interest rate or the annual percentage rate (APR). Idaho usury law states that this amount can be no more than 12%. For judgment rates, consult the Idaho State Treasurer’s Office website to ensure compliance with the law if the borrower defaults. Payment information. The most common method of payment for Idaho promissory notes is the installment method. Borrowers make payments on a regular basis. The most common installment arrangement is monthly payments. The total number of installments as well as the payment amount for each should be listed. If the lender uses a late fee, the amount of the late fee should be listed as well as how many days past the due date the late fee will be assessed. Secured Idaho promissory notes need another piece of crucial information: information about the collateral that the lender may take possession of if the borrower defaults on the loan. Interest Due in the Event of Default. This clause explains how much interest the borrower will be required to pay if they default on the loan. Remember that the lender should consult the Idaho State Treasurer’s Office for the proper information. Payment Allocation. This clause explains how the payments made by the borrower will be split between the principal balance and the interest. Prepayment. Sometimes, borrowers want to pay off their loan early. This is known as prepayment. A prepayment clause explains whether there are any penalties for paying off the loan early. Acceleration. An acceleration clause informs the borrower that if they do not uphold their obligations, the lender may demand full payment of the loan. Attorney Fees and Costs. If there is a problem that arises over the Idaho promissory note, this clause explains who will pay attorney fees and costs if needed. It could be that each party pays their own fees and costs. It could also be that the borrower is required to pay the fees and costs for the lender if the borrower is found in default by the court. Waiver of Presentments. This clause explains to the borrower that they must make payments even if the lender is not physically present when those payments are made. Severability. A severability clause states that if any part of the promissory note is unenforceable, only that part shall not be enforced. The rest of the promissory note will still be in effect. Conflicting Terms. If conflicting terms are found in the promissory note, this clause explains that an amendment will be drafted to clarify the terms. The amendment will override the conflicting terms. Notice. A notice clause explains whether the lender will give notice to the borrower if they file a lawsuit for default. Governing Law. This clause documents the state that will govern the agreement. This is especially important if the parties to the note are located in different states. In Idaho, there is no legal requirement to have the lender sign the promissory note. It also does not need to be witnessed or notarized. 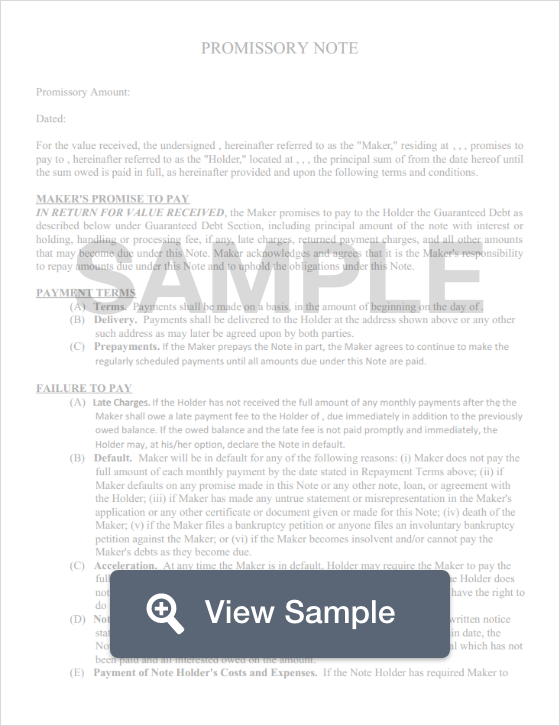 The borrower must sign and date the promissory note. If there is a co-signer, it is important to have their information in the document and to also have them sign the promissory note.